Latest Update: Version 2.0 light curves now available. Version 1.0 files are deprecated, but the v1.0 CBV files are available for posterity. Example of KEGS light curves from one K2 channel. 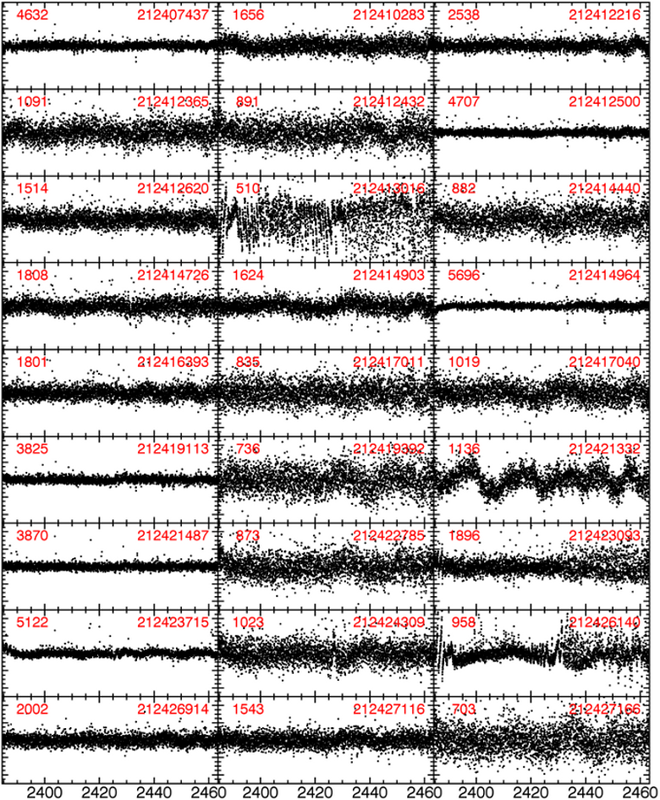 These plots can be used to check for similar variability in multiple targets, indicating systematic and not astrophysical variability. The y-axis ranges from +/- 5%, red numbers are counts in DN/s and the EPIC IDs. The light curves from K2 contain larger systematics than the original Kepler mission, due to the reduction in pointing precision as a result of having to rely on only two reaction wheels. The KEGS project creates detrended light curves for extragalactic targets observed in K2. The team constructs their own cotrending basis vectors (CBVs) using the galaxies on each channel using a PCA analysis, solving for CBV coefficients alongside the sawtooth pattern coefficients introduced by the pointing drift. Supernovae are analyzed in a similar fashion, but the light curves before and after the events are used to solve for the CBV coefficients. The team have released their extracted light curves and diagnostic plots for each target. Five versions of the light curves are available for each target, using a different number of CBVs. Diagnostic plots are provided by the KEGS team that show each target on a given Kepler channel as well. These plots can be used to check for similar variability between targets, which could be indicative of false positive variability caused by uncorrected systematics. The apertures used for each target are also available within the FITS files. There are two types of files available that apply to multiple targets. These are stored in separate directories, and are available for download in the Data Access section below. hlsp_kegs_k2_lightcurve_cbvs-c<##>-ap5_kepler_v<#>_llc.fits = A FITS file containing the CBVs for each channel. The channels are identified as the "MODOUT" keyword in the FITS extensions. Each Campaign has a single FITS file containing the CBVs for that Campaign. hlsp_kegs_k2_phots_chn<##>-ap5-pca5-<#>-c<##>_kepler_v<#>_prev.png = A collection of PNG files containing preview plots of the light curves for all KEGS targets on a given channel (these range from #1 - 84). Each channel has between one and a few preview plots, depending on how many targets are on that channel (these are sorted into "pca5-1", "pca5-2", etc. for each channel). The y-axes range from +/- 5%, while the red numbers are the counts in DN/s and the EPIC IDs. These png files contain preview plots using a 5-component PCA. The zero-padded Campaign number is also included in the file name. v<#> is a 1-digit version number, e.g., "v2". _llc.fits = A multi-extension FITS file containing the detrended light curves for multiple numbers of applied CBVs (first extension) and the aperture used (second extension). The detrended light curve includes the raw flux ("FRAW" column) and "FCOR1" through "FCOR5", which contain light curves detrended using between one and five CBVs, respectively. The time is stored in a column called "TIME" and is in "Kepler BJD" format (BJD - 2454833.0). _llc-fcor<#>.png = A series of preview plots for each of the detrended light curves, using <n> CBVs. For example, the preview light curve using three CBV files is named "*llc-fcor3.png". You can download the CBV FITS files directly. You can download the preview plots of all targets from a given channel here. They are also available on the bottom of each target's individual webpage. These webpages are linked to in the search results table from the KEGS search form. They are also available in the "view external webpage" button from any KEGS result row in the Discovery Portal. The KEGS light curves are available in the MAST Portal. The KEGS data will show up in regular searches, alongside light curves provided by the mission and other K2 HLSP light curves. If you'd like to search only KEGS data, you can use the Advanced Search link below the target search box to filter on "Project = hlsp_kegs". Note: you do not need to enter a search in the target search box before visiting the Advanced Search link. Users can also use the web form to search for KEGS targets. The top panel allows you to search on any resolvable target name or coordinate cone search. You can search for a specific K2 ID and/or Campaign in the middle panel. The bottom panel allows you to add or remove output columns and change the output file type.